The green glow in the sky is, sadly, not the Incredible Hulk. Editor's Note: This story was updated at 8:15 p.m. EDT. Officially known by the more drab name of C/2017 S3, the comet was discovered on Dec. 23, 2017, by the PanSTARRS telescopes in Haleakala, Hawaii. The flying, green space rock has already given skywatchers a couple of surprising treats, with bright bursts exploding from its surface twice in close succession — first on June 30, and then again about two weeks later, Sky and Telescope reported. As Hulk himself might say, "Comet flash!" Whatever its origin, the second eruption on C/2017 S3 created a huge cloud of gas surrounding the icy object, extending nearly twice the size of Jupiter, to around 161,000 miles (260,000 kilometers) across, according to Austrian amateur astronomer Michael Jäger‎.Its greenish hue is the result of cyanide and carbon molecules being warmed by the sun and becoming ionized, meaning their electrons and protons separate from one another, causing a characteristic glow, Brian Koberlein, an astrophysicist at the Rochester Institute of Technology in New York, reported on his blog. 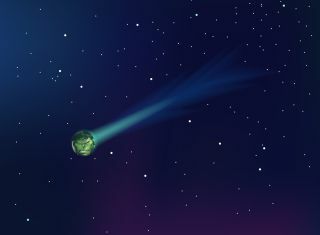 Some news reports have quoted a Russian scientist as claiming that the jolly green comet will cause some sort of apocalyptic upheaval on Earth. Worry not! Like its green-skinned superhero namesake, C/2017 S3 is far more benign than it seems. But Russian astronomer Stanislav Short of the telescope astronomical station Tau has said the comet poses no danger and that such objects pass by our planet all the time without incident. C/2017 S3 will be about 70 million miles (112 million km) from Earth at its closest approach. The comet will then head toward the sun, swinging around our central star on Aug. 16 and then zipping back out to the distant reaches of our solar system. Right now, the comet is too close to the sun to be visible, but it may be visible later in August after it rounds the sun and comes around again, Paul Chodas, the manager for the Center for Near-Earth Object Studies at the Jet Propulsion Laboratory, told Live Science. Editor's Note: This story was updated to note that C/2017 S3 is not currently visible, as it's too close to the sun. A previous version of the story said the comet would be visible with binoculars tonight.